My name is Thierry. I've kicked a ball ever since I could stand up and I've supported Arsenal ever since I can remember. I am a player at Esher FC and my favoured position is as a left sided winger or forward. I love scoring but being able to pass well and make assists is a great feeling too. In the 2010/11 season I played a year ahead of my age in Claygate Royals FC U6's. One day I want to play for the Arsenal ! My dad helps me with this website. 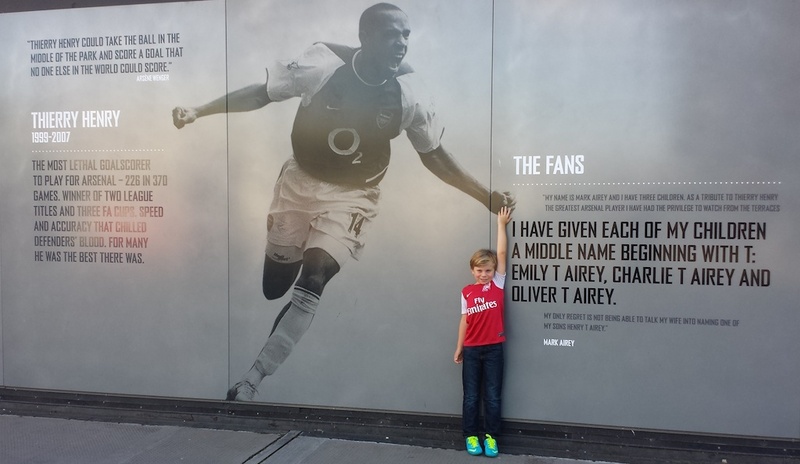 He's supported Arsenal since he was about my age when Arsenal won the 1970/71 Double. 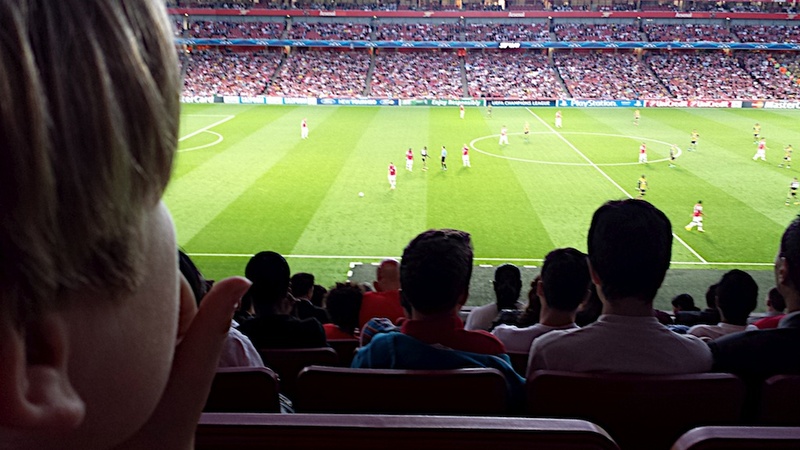 Arsenal vs Fernabahce on Club Level ! A goal on Father’s Day ! 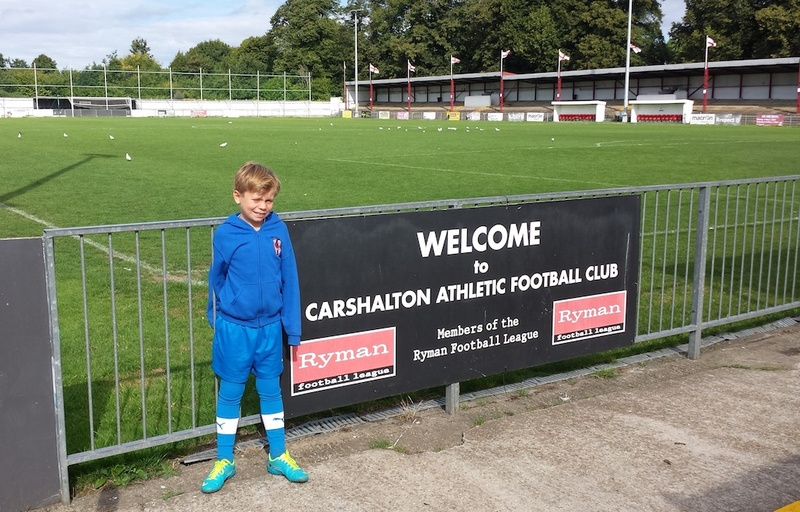 The first game of the season for Esher FC Blues U8 team was away at Carshalton Athletic FC. And what a game ! 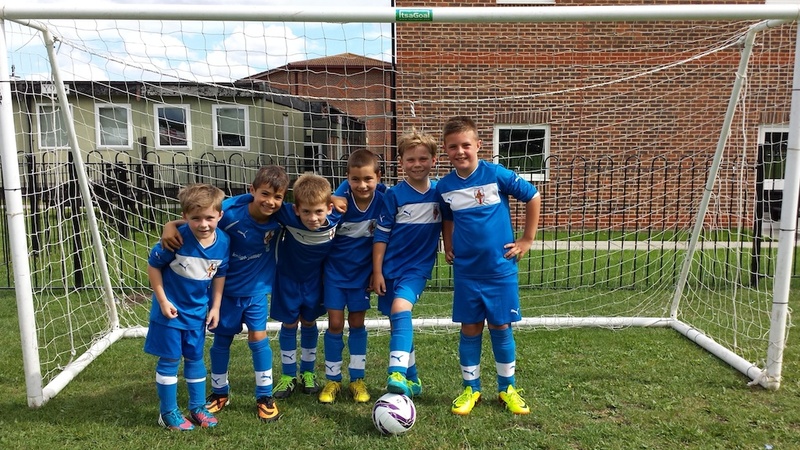 The team started the new season just like they and the other U7 teams finished last season. That means lots of passing, fast counter attacks and clinical finishing. The game spread over two 20 minute halves was a real joy to watch. Thierry started the game in goal and made a number of decent saves ! In the second half he spent time on the wing and as a striker. He scored twice which included a simple tap in ‘fox in the box’ type of goal and the second which he picked up at half way, controlled shot at range into the bottom right hand side of goal. A great game to watch and congrats to Thierry’s team mates Jacob, Joaquim, Tom, Myles and Ted for their 8-2 victory and giving their parents so much to smile about. 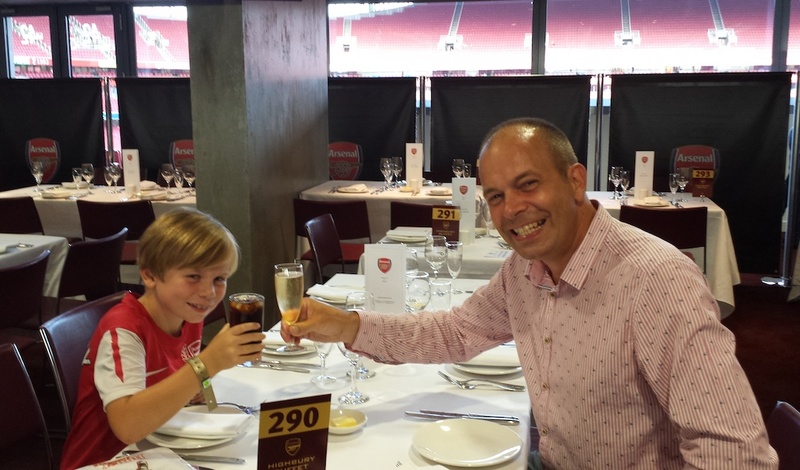 Thierry and dad had a chance to watch the Arsenal 2-0 win against Fernabahce. The win enabled Arsenal to progress through to the group stages of the Champions League. As a treat from mum we had Club Level hospitality and great seats to watch the game. Thierry’s swimming has progressed really well so we wanted to give him a name check for this. As it happens while we were on holiday he had a go at scuba diving and spent the best part of an hour enjoying the experience. 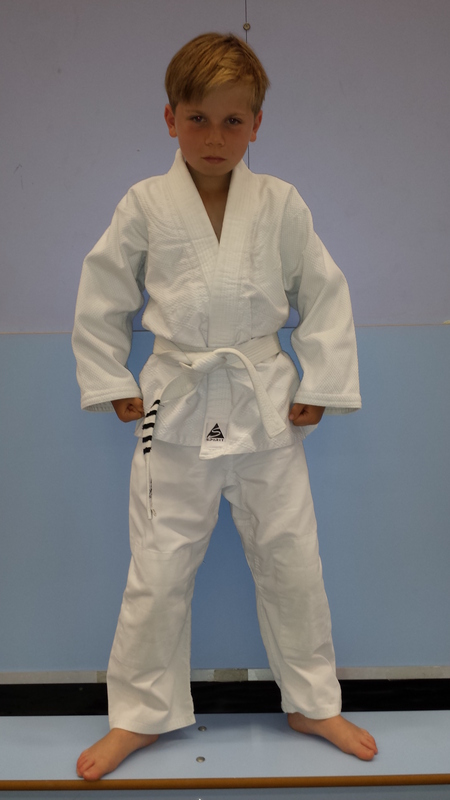 Thierry fought his way to a stunning second place position in his first ever Judo competition. He competed in the 30kg 7/8 year old group and fought 7 fights, losing out finally in the final. 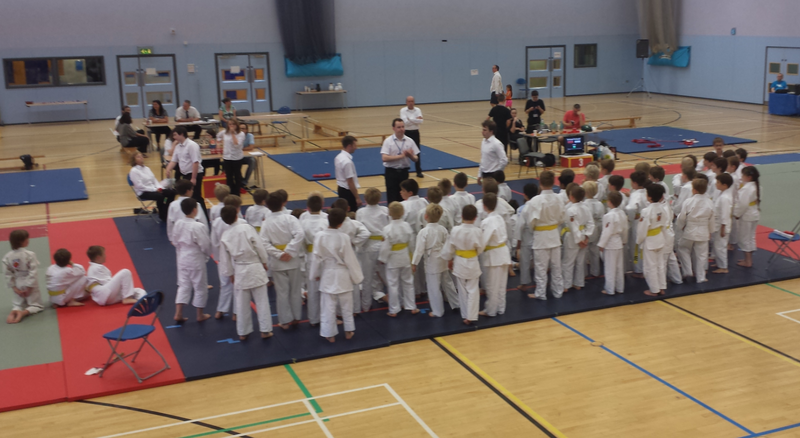 The event was held at Elmbridge Xcel Leisure Centre by the Tora-Kai School of Judo. The event had many attendees there. This photo shows just some of them. 8am on the road for a 102 team football tournament today at Brockham 2013 Tournament. What an amazingly well run event and many thanks to the organisers. 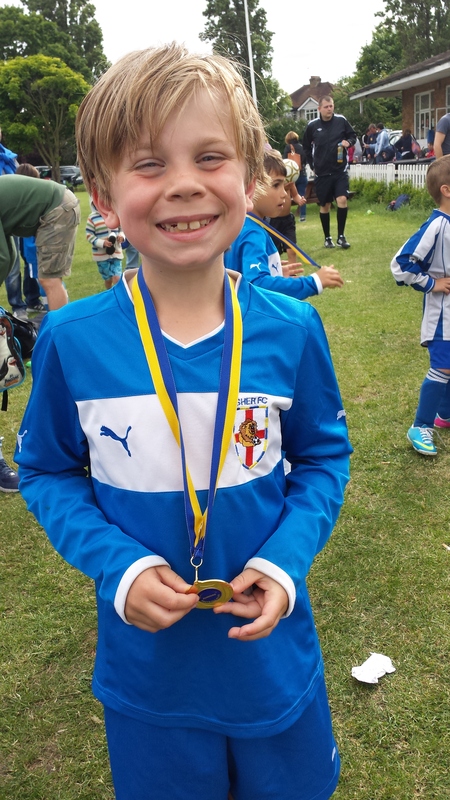 Both Esher U7 teams won all their respective 5 matches each with Thierry’s team, playing as France, scoring 15 goals and letling in just two. He scored a goal for dad on Father’s day and kept a clean sheet in goal. Thierry had time to enter a competition and had his shot measured at 56 kph ! Nice one son. 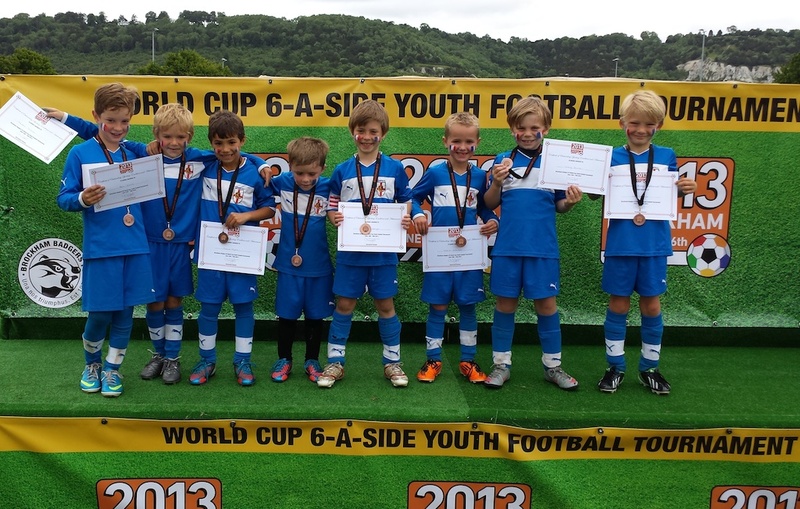 Thierry played in his first tournament of 2013 in the Esher FC 2 team yesterday at Staines & Laleham Sports & Leisure. He was predominantly on the left side for the five ten minute games. The team fared really well winning three games, drawing one and narrowly losing one. Five goals were scored with only 2 conceded. Esher Wizards Whites played their last scheduled game of the season on Sunday. This was a real humdinger of a game, played away from home, against a strong spirited Staines side. Esher went 2-0 up in the game but Staines mounted a comeback in the 3rd period of 15 minutes with the game ending 3-3. The Wizards did exceedingly well given they had no subs to rely on in what was a six a side game. Thierry played his part working the left wing and got a pin point cross in to create an assist for Luke to score the first goal. All in all this was a good old fashioned cup tie type of game. It was our team’s first draw of the season. And what a great season too. One draw and only one loss in a total of 20 or so games. What a team !! Now we’re looking forward to a few tournaments over the next few months.